What makes a nuvoH2O better then other softeners? How does the nuvoH2O compare to other salt-free alternatives? Why does the square footage of the home matter? How do I install the nuvoH2O Salt-Free Water Softeners? Do you have local dealers who install your systems? How do I replace a cartridge? How often do I need to replace the cartridge in the nuvoH2O? What are the prices for replacement cartridges? 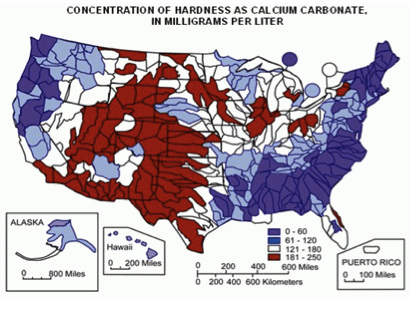 What problems are caused by "hard water"? What problems are caused by the use of salt in other softeners? What are some additional problems caused by other softeners? How does nuvoH2O soften water? How long has the nuvoH2O water softening process been in use? How much money can I save by using the nuvoH2O? How hard is the water where I live? What is the maximum hardness that the nuvoH2O system can handle? Will the nuvoH2O work with my well water? Will a nuvoH2O help protect my tankless water heater? Will the nuvoH2O help clean the white chalky substance from the inside of my dishwasher and the spots from the dishes? Can the nuvoH2O remove the white scale buildup from my showerhead? Can the nuvoH2O help take care of iron staining in my toilet bowl and the dull, rust coloring of my clothing? Do you provide a free (WTK) Water Test Kit? Does nuvoH2O use any type of EDTA in their water conditioning process? Why does the nuvoH2O system not lower my gH (grains hardness)? Why is my nuvoH2O system leaking? How long does it take to receive my nuvoH2O system once I have ordered it? No harmful salt – Avoid the hassle of constant salt replenishment and protect your health and our environment from the harmful effects of salt used in other softeners. Eliminates existing harmful scale – Other products may prevent scale buildup but don’t remove existing scale. Scale buildup clogs and corrodes your pipes, fixtures, and appliances. Compact design – The 152mm by 609mm unit only requires a simple cartridge replacement about once every 6 months, depending on the size of your home and your water usage. Experience – Technology adapted for your home from nearly 30 years of experience in serving some of the nation's largest businesses. Costs 50% to 80% less than other softeners. Save thousands of dollars in household expenses – provides more efficient, longer-lasting pipes, fixtures, and appliances, allows you to use less soap, detergents, and lotions, and makes cleaning your home easier and faster. See how much you can save! Effectively softens the water throughout your whole house, both hot and cold water—no need for replumbing to avoid drinking or watering with treated water. The nuvoh2o cartridge must release enough of the “chelant” to travel the distance of your home. The fewer the people in a home usually means less water usage. Typically you would get more months of usage out of a cartridge with fewer people. The size of home would still determine the size of system you should purchase. Many homeowners are able to do it themselves with only a few additional parts required (see Installation Instructions for a list of possible additional parts--we don't provide these installation components only because each customer's installation may require slightly different parts). The installation may take less than an hour, depending on how the pipes are configured in your home. Customers report paying as little as $150 for a quick installation and up to several hundred dollars where many pipes require reconfiguration. Because of our innovative, compact design (the Whole-House System measures only 152,4mm wide x 609mm long), no electronics, and no by-pass loop or drain requirements, the system can be located in places other softeners can't go, such as condos, small utility rooms, or even outside (in warm climates). Yes, we have many dealers installing our products throughout Europe. If you would like help in identifying an installer please call us at skype number +356 35500949. We are happy to email or mail a full detailed description of how to replace a cartridge. Please call our customer service department for details, skype +356 35500949. Each Whole-House Cartridge should treat your water for about 6 months and the Studio cartridge for about 3 months, depending on the size of your home and your water usage. We're working on a more convenient method to help you determine when you should replace your cartridge. At this time, you should notice qualitative differences in your water within the above time frames to indicate when your current cartridge is expended. Depending on the size of the nuvoH2O system purchased, the replacement cartridges range between 50,00€ and 110,00€ plus VAT. We recommend replacing your nuvoH2O cartridge every 6 months. Hard water contains significant levels of minerals like calcium and magnesium. The term "hard" comes from the difficulty in cleaning the scale and soap scum from these minerals in the water. These minerals are not normally harmful—they're actually essential for our health—but they can wreak havoc on your skin, hair, clothing, and linens and clog and corrode your home pipes, fixtures, and appliances, costing you thousands of dollars. Hard water causes many household problems costing consumers millions of dollars annually in cleaning, maintenance, and replacement of pipes, fixtures, and appliances from scale corrosion and clogging. In addition to limiting their life, scale build-up in hot water heaters decreases their efficiency by requiring more energy to heat the water. Cleaning problems from detergents not fully removing dirt: Clothes feel rough; dishes and glassware are spotted; shower doors, walls and bathtubs retain soap scum; hair is dry and looks dull, and skin has a film of sticky soap curd. The film may prevent removal of dirt and bacteria and lead to skin irritation. Health Risks: For traditional water softeners, sodium is released into the water to be consumed at the rate of about 8 mg of sodium for every grain of hardness removed from water. Users of these units should consult with their family doctor to adjust their diet to account for increased sodium intake. Dangers of Household Use: Salt in softened water can kill houseplants, lawns, and gardens. Environmental Concerns: Traditional water softeners discharge as much as four gallons of salty water for every gallon of treated water. In addition to the problem of the wasted water, many cities are banning the use of salt in softeners to stop its harmful effects on water treatment systems. The significant wastewater discharged from other water softeners may overload or reduce the effectiveness of septic tanks and sewer systems. nuvoH2O Water Softening Systems don't waste any water. Softened water from other systems is not recommended for use in steam irons or evaporative coolers. NuvoH2O Water Softening Systems don't have any such restrictions. Other whole-house water softeners can cost as much as $3,000, to begin with, and then $4 – 40 per month for replacement salt. The sophisticated electronics in other softener systems require periodic adjustment from a trained technician. And all the electronics and moving parts in these systems mean that other softeners only have about a 10-year life expectancy and break down frequently. NuvoH2O Water Softening Systems have no electronics or moving parts and a Lifetime Warranty and Money-Back Guarantee. Other water softeners require constant maintenance, including pouring large bags of salt into a brine tank each month, or more often depending on water usage. The nuvoH2O Salt-Free Water Softener uses a small cartridge which is easily replaced about twice per year (every 6 months), depending on your water usage. Most other softeners condition your water by removing the healthy minerals. These minerals are beneficial to our health and should remain in the water. NuvoH2O Salt-Free Water Softeners use the basic scientific principle of CHELATION, which eliminates the hard water without removing the beneficial minerals. Some systems use magnets or "catalytic media" to soften your water. Independent studies debunk such claims—one study from Purdue University found "....no significant, beneficial variation in the physical or chemical water quality parameters measured". NuvoH2O Salt-Free Water Softeners condition your water using on the basic scientific principle of CHELATION. Save thousands of dollars in household expenses – Provides more efficient, longer-lasting pipes, fixtures, and appliances, allows you to use less soap, detergents, and lotions, and makes cleaning your home easier and faster. See how much you can save. Protect the life and performance of pipes, fixtures, and appliances. Dramatically increase the life and efficiency of hot water heaters. Gas water heaters operating on hard water consume almost 30% more energy. Use up to 55% less soap! Clothing and linens last as much as 30% longer. Easier home cleaning – Time to do housecleaning could be cut by almost half (50%), saving you time and money. Healthier, smoother skin and hair. Cleaner, softer, brighter, longer-lasting clothing. The nuvoH2O system uses a technology to soften hard water called CHELATION which keeps the minerals soluble and unable to cause hard water problems. The resulting water is soft and healthy for all of your household uses, including drinking, bathing, washing, lawn and plant watering. Yes, the nuvoH2O system once installed on your main water line is safe to drink. The nuvoH2O cartridge "chelant" is food grade and FDA approved. The nuvoH2O system is not a filtration system and will not filter out anything in the water. If your water was safe to drink before you installed the nuvoH2O system it will be safe to drink after. There will not be a change in taste by adding the nuvoH2O system. The nuvoH2O Salt-Free Water Softeners use a process called CHELATION (pronounced key-LAY-shun). Our formula, called "Citryne", stops the minerals from causing hard water problems by making troublesome minerals "soluble" so they wash away freely from your body, hair, dishes, pipes, fixtures, and appliances in addition to gradually removing existing scale. The same principle is used in many common detergents to overcome hard water at the point of use, such as Calgon, Dove, Tide Total Care, etc. *Citryne is FDA approved. You will not taste, smell, or see it in the water. We offer several models of cartridges for various levels of water hardness from slightly hard to extremely hard. Each Whole-House Cartridge will treat about 50,000 gallons and the Studio about 25,000 gallons. For 30 years the nuvoH20 has been improving water for the nation’s largest food-service businesses – from amusement parks to Las Vegas casinos. Now the nuvoH20 commercial-grade technology is available for home use. The average family of four can save over $2,000 per year with the use of a good water softener. The nuvoH2O cost 50% to 80% less than comparable water softening systems. Save money on plumbing, personal care items, clothing and linens, energy consumption, soaps and cleaners, cleaning time, and water softener replacement. PLUMBING: The lifespan of appliances such as water heaters, washing machines and dishwashers can be reduced by as much as 30% because of hard water. In addition, repair costs are higher for these appliances. PERSONAL CARE ITEMS: Hard water can dry skin and hair because the minerals combine with the soap to form a sticky residue that's difficult to rinse away. With soft water hair and skin are smoother and healthier looking without using as much lotions and conditioners. CLOTHING AND LINENS: Clothes last longer and look better when washed with soft water. The life of clothing can be prolonged up to 15% when washed in conditioned water. When detergents mix with hard water, they form lime deposits which can cause yellowing or graying of clothes. As the deposits accumulate, they contribute to fabric stiffening and matting. ENERGY CONSUMPTION: Water heaters work nearly 30% more efficiently when operating on soft water. SOAPS AND CLEANERS: Approximately 12 - 14% of a family’s grocery shopping budget is spent on soaps and cleaners. Since soaps and detergents work more efficiently in soft water, you could use up to 50% less soaps and cleaners with soft water. And you'll be able to obtain the same optimum results using shorter wash cycles and cooler water. CLEANING TIME: Soft water reduces the amount of time for weekly household cleaning from four hours to two hours and 21 minutes. That’s a savings of about 11 8-hour work days per year or about $1,300 (at a conservative cost of $15 per hour). WATER SOFTENER REPLACEMENT: Most traditional water softeners have a limited lifespan of about 10 years. The nuvoH2O Whole-House Water Softener is guaranteed to last a lifetime. Yes. A nuvoH2O Softener can certainly help improve the quality of your well water. While the minerals in your well water are good for your health, they wreak havoc on your pipes, fixtures, appliances and cleaning efforts causing pipe corrosion and metal leaching into your water. Our salt-free water softeners are designed to condition the water hardness while balancing the pH. And you won't have any salty wastewater dumped back into your eco-system. Yes. The nuvoH2O Salt-Free Water Softener renew and extend the life and performance of your tankless water heater by removing the build up of scale inside your tankless water heater. No, the nuvoH2O softener system does not remove anything from the water. It is not a filtration system. nuvoH2O does carry some water filtering systems, contact us at skype number +356 35500949 for details. Yes. High heating in your dishwasher accelerates the formation of scale, which clogs and corrodes your pipes, fixtures, and appliances, as well as making everything look unsightly. The nuvoH2O Salt-Free Water Softener not only prevents scale formation, but will also eliminate existing scale. In addition, the nuvoH2O system keeps the minerals in your water from interfering with the operation of your dishwashing detergent, since hard water requires more detergent to get proper lathering and cleansing and causes troublesome soap scum. Many customers install the small nuvoH2O Studio system under their kitchen sink to directly treat the water in their dishwasher. Yes. nuvoH2O Salt-Free Water Softeners are unique in their ability to prevent scale buildup and to remove existing harmful scale from your pipes, fixtures, and appliances. Most importantly, cleaning the scale from your hot water heater will improve its efficiency by as much as 30% and prolong its life. nuvoH2O is able to remove scale because it uses the process of CHELATION, which is able to make the hard water minerals soluble so they wash away freely from your pipes, fixtures, and appliances, as well as from your hair, body, and kitchenware. No water treatment system will be able to remove existing iron staining in your toilet bowls and clothing. Iron is a tricky mineral that is held in suspension and has to be removed by introducing chlorine into the environment and then the chlorine must be removed by some type of carbon filter system. However, our CHELATION system can remove the metal ions that help to bind and stabilize most stain structures, making the remainder of the stain easier to clean. We recommend using a commercial cleaner "Rust Stain Magic" for your bathroom and "Yellow Out" for your laundry. As mentioned above, our system in some cases will be able to help you avoid future iron oxide staining by treating the iron in the water but we cannot guarantee it. The nuvoH2O system does not remove chlorine. The nuvoH2O system is a water softener system not a filtration system. nuvoH2O does carry some water filtering systems, contact us at skype number +356 35500949 for details. The nuvoH2O system does not remove sediment. The nuvoH2O system is a water softener system, not a filtration system. Yes, we are happy to provide you with a Water Test Kit. We test the pH level and the gH (grains hardness) in our lab. It is pre-paid and provided by the company. Please call our customer service center for details. Absolutely not. EDTA or ethylenediaminetetraacetic acid is sometimes mistakenly linked to all chelants and the treatment of lead and other heavy-metal poisonings. nuvoH2O does not use any type of EDTA chelants in our CHELATION process. Our product is FDA approved and completely safe. Traditional salt-based systems remove the GPG (grains per gallon) from the water and replace them with salt. This is called an “ionic exchange”. The nuvoH2O system uses a new technology called CHELATION. The nuvoH2O system leaves the hard water minerals in the water, but chelates them. The minerals in the water bond to the added "chelant" instead of your skin, shower doors or dishes. Once these minerals have bonded with the chelant, they cannot bond again to anything else, therefore you will be getting all the healthy benefits of having the minerals in the water, but they will not form the hard water build up that produces scale. The softener should not be leaking in the "off" or "softener" position. If the system has been turned to bypass, water will release out of the black cap. This is normal. Water pressure is releasing which will enable you to unscrew the collar and replace the cartridge. If the nuvoH2O system is leaking from the side ports they may have been over tightened during installation. Please contact technical support: skype number +356 35500949 for assistance. Make sure all packaging surrounding the softener cartridge is removed (i.e. – plastic wrap, gray foam). If not, this can cause leaking from the collar. If the black cap is leaking in the "off" or "softener" position, the "o"-ring inside the blue hood may not be seated correctly. When installing the L-bracket onto the manor head, the white inner piece may have dropped downwards. Press the white inner piece upwards and tighten the screw in the center of the black cap. Be sure the black "o" ring is seated properly on the top of the whiter inner piece. All nuvoH2O systems are assembled in Italy. Typical delivery times are between 4 – 10 business days for standard ground shipping. Instead of bulky salt bags, nuvoH2O uses a lightweight, compact cartridge. nuvoH2O uses 4x less water and absolutely no electricity.